It's Purple Day!! Maybe you are like I was and don't know what Purple Day is all about. It is a day to promote Epilepsy Awareness. Our dear friend, Fiki, over at Bad Kitty's Craftroom has organized this important hop and I am honored to be a part of it by featuring a purple card on my blog today. There are giveaways on some of the hop stops, so you will be sure to want to visit each blogger on the list you will find below. I love purple almost as much as I love pink, so it was an easy decision to use purple AND pink in my card for today. I decorated an envelope for it, too, with heat embossing and doodling with my Sakura Moonlight and Souffle gel pens that show up on the deeper color envelope. Here are more interesting facts about Epilepsy. I learned a lot by reading through these! Now for my blog candy......I have a small surprise package of crafty goodies for one lucky commenter who mentions something new they learned about epilepsy in their comment on this post. My giveaway is open internationally and I would appreciate you leaving your email address (in code) in your post so I can contact you. Deadline for comments is 11:59 pm Pacific Daylight Time on March 31, 2019. I will randomly draw the winner from qualifying comments and post it on my blog soon after that. Thank you, Fiki, for organizing this hop.......and thank you to all the participants and hoppers!! Oh, adorable card for this Blog Hop!! I love purple, too, and your design is amazing with that fun flying cat! Love the decoration on the envelope, too! Hello, Janis! Your card and matching envelope are adorable! I love the angel kitty with flowers and gorgeous purples and pinks! This is an informative hop. I don't think I'm eligible for your prize because I'm part of the hop, but I learned about tonic clonic seizures. Hello Janis! Your card is gorgeous and the envelope is super cute! Such an exciting blog hop and I am so happy to be a part of it and spread such an important message. your card and envelope are reallly beautiful and i love the colors too. 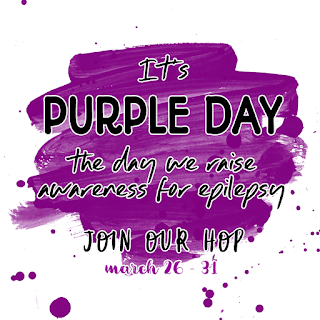 Thank you for taking part in the Purple Day epilepsy Awareness Blog Hop to create awareness about epilepsy. MYTH 5: The only side effects of a seizure are tiredness and being confused. Today i learnt that these are not the only side effects. I also had a rare form of epilepsy for years. But thank God I have got over it now but i know how it feels to hv the worry of not knowing whjt will happen next situation. Thank you for your extra kindness. I am also tryinga nd hoping to win your craft goodies. my email address is surekhagalagoda@gmail.com. I learned you aren't suppose to hold them while they are having a seizure. Thanks for bringing awareness to Epilepsy. Oh your card is super sweet! I cant tell you anything new because I learn so much past years. Gorgeous card and a wonderful matching envelope. All do and don't are new to me, as I did not know enough about epilepsy. This is a great awareness bloghop. Thanks for offering a prize. Such a pretty card in purple to spread the awareness through this amazing hop! I love the matching envelope too! In my relatives one of the member is suffering form this epilepsy and it sure helps me to increase my knowledge! Thanks for the opportunity to win your generous giveaway! Great card, love the matching envelope. I had no knowledge about epilepsy, so learnt a lot about it. I had no idea that it occurs to 1 in 100 people. Thanks for the chance to win. Great thinking outside the box with kitty's feathered wings, Janis. A really cute card! Thanks for sharing with us at Allsorts challenge this week! Janis, this dreamy floating kitty caught my attention immediately in the gallery. Love the purple to add to the dreaminess. Glad I came by to learn more about Purple Day. I too was incorrectly under the impression that "swallowing their tongue" was a huge danger of an epileptic seizure, and thus something to watch for. Glad to know it apparently is not. That is a wonderful card design and I love the pink and purple colors used on it. Thanks for helping teach us about this disease too. I learned so much. 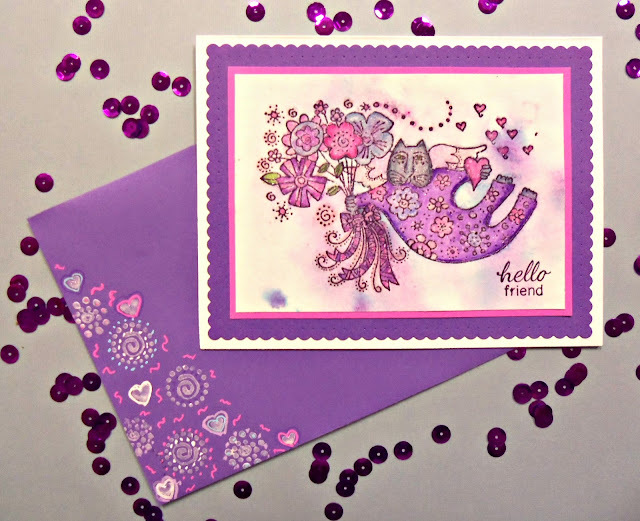 Love your beautiful pink and purple card! You colored it beautifully and I love that sweet kitty! Thanks for bringing awareness about Epilepsy to the public! It is such an important topic! LOVE your beautifully colored card, Janis, and the matching envelope is just beautiful!! The postal works are sure to ooh and ahh over it if it gets sent thru the mail to someone. :-) I learned a lot about epilepsy as I really didn't know much at all! I thought convulsions were always part of the symptoms, but they aren't. And 1 in 100 people?! Really?! That's just crazy. Such a fun card! I have known several people with epilepsy. Thank you for sharing this informational and inspirational hop!! I learned that you should never try to hold someone who is having a seizure. Your card is beautiful and I like your photography with the purple sequins too! SQUEAL!!! That Laurel Burch cat is too much! Love the purple flowered pjs and all that glimmer. I thought I was pretty familiar with epilepsy but have to say that the number of people who have it kind of surprised me. One out of a hundred is very common. Thanks for participating in the hop and making me smile with this adorable card. What a fantastic reason to hold a blog hop. Thank you for participating! I am interested to know how prevalent epilepsy really is and that it is not that rare at all. Love your purple kitty card! Purple and pink and a cat--how wonderful. I learned the proper way to put a person in the recovery position. Wow is this a cute card, and the matching envelope is gorgeous! I haven't heard of those gel pens but they look awesome on dark backgrounds. This angel cat is bringing a huge smile to my face and the fact that it helps support the hop is even better. I learned that epilepsy can cause symptoms that aren't widely known, like sleeplessness or confusion. Love your purple and pink card! 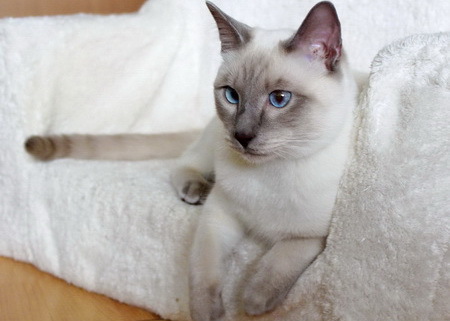 That cat is just adorable, and the Lilac-Point Siamese is a beauty too! I learned about the origin of Purple Day and the first event held in 2008! I am learning a lot about epilepsy awareness along the hop! Great that a 9-year old initiated the Purple Day concept ! Something I did learn is that 1 out of 100 people got epilepsy - I wasn't aware it was that many. sigh ! Your card - and envelope - are great ! Thank you for sharing your creations in this important, heartwarming bloghop ! Happy Birthday, Lieve, and may strength and blessings be yours as you and your family care for your dear sister. Thank you for taking the time to comment on our hop. Lovely take on our theme this week. Thank you for joining our challenge at Allsorts this week with your project. Janis, I accidentally deleted my comment :) Love that purple kitty!! He looks so happy. I've learned so much during this hop and didn't realize how common it is and I've always thought convulsions were the most common symptom. Thanks so much for the chance to win. Hi Olga, I am your new follower. Today I learnt that Epilepsy is not rare. I couldn't image that one in every 100 people suffer. Absolutely gorgeous, such a sweet image and fabulous design. I learned a lot about epilepsy awareness along your post! But I was most surprised that 1 out of 100 people got epilepsy. That's really a lot. I had never heard of Purple Day before, thanks for making it more well-known. 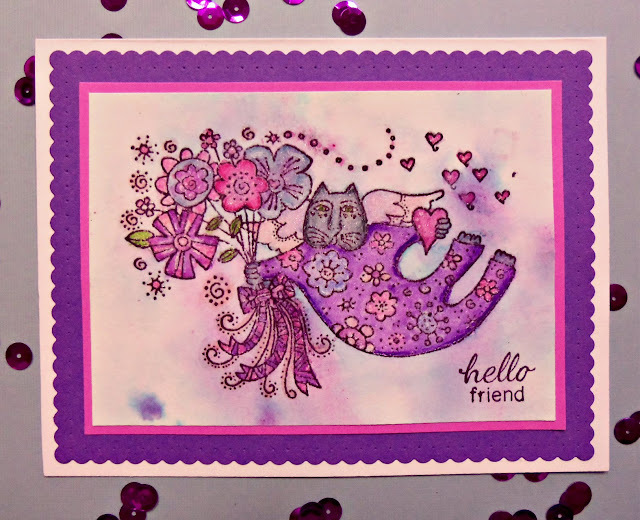 Your card is very cute and that kitty looks fabulous in purple and pink! Thanks for playing with The House That Stamps Built. Lovely to see you on this Hop. So very sorry, Patricia. Thank you for taking the time to comment on our hop. May your heart be comforted with loving memories of your sister. I love your purple and pink card so sweet the Image Cat fly...great coloring too...sweet card Janis..
Great card... I especially love the background! Really? Left over Easter egg dye?!? My only kid is too old for dyeing eggs, but I'm going to get a package of tablets and give it a go! I learned that not all Epilepsy seizures cause convulsions. I never knew that! Makes me wonder if my son's friend has it as he doesn't drive, but his family never warned us about seizures with him spending time at our house without them. Thanks for sharing those myths! I see you read my supply list and saw my leftover Easter egg dye background. :) One year I dyed eggs with my granddaughter and couldn't bear to throw away that lovely colored water. So I made backgrounds with it!! So much fun. Hope you give it a try!! !